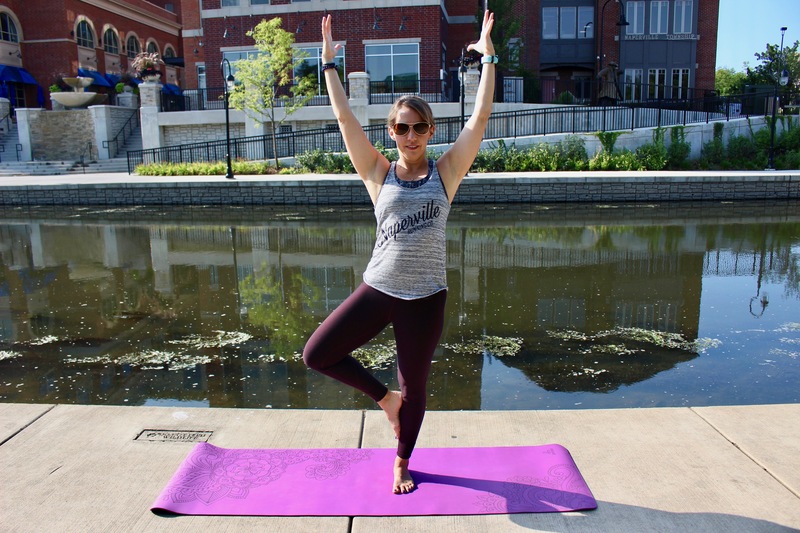 As a yoga instructor, mother, and business owner, Naperville Running Company team member Jenny Wachter stays healthy and focused with her personal yoga practice. Here's Jenny's advice for runners who want to add yoga to their running routine. NRC: How did you start doing yoga, running, and biking? JW: I've always loved being outdoors and staying active. I participated in softball and cheerleading through school, but it wasn't until my dad invited me to join him in a 5K that I started running. As a former science teacher, I love to educate and encourage others, so being a yoga teacher and running coach is a natural fit. NRC: How can yoga help someone with everyday aches and pains? JW: First, yoga teaches mindfulness, which is key. Runners are driven and used to pushing themselves through discomfort. Learning to listen to the body gives clues as to what the body needs. Also, during a weekly yoga practice, runners can use poses to target their tightest and weakest spots, improving range of motion and strength to keep muscles and joints healthy. As a bonus, they develop balance and focus. NRC: How can yoga help runners? JW: Yoga for runners is about making sure the body is flexible enough to travel through the range of motion required in their sport, but also about strengthening muscles, especially the core. I have so many favorite poses, but my top five yoga poses for runners are: Plank, Boat, Tree, OneLeg Forward Fold, and Supine Spinal Twist. NRC: What is your best advice for someone who wants to add yoga to their running routine? JW: I would suggest finding a teacher who specializes in yoga for athletes. Runners already get their cardio in, so they don't need a super-challenging, sweaty class. Choosing a class that accomplishes both strengthening and stretching is key, especially with a teacher who focuses on correct alignment. NRC: What motivates you on the hard days? JW: I credit coffee for getting me going! And on the hard days? Last year, I overheard my twelve-year-old son on the phone with a buddy. He said, "My mom's a runner. She is strong." I replay that in my head when I want to quit!